Following the events of The LEGO Movie, the world inhabited by sentient LEGO beings has fallen into chaos. It has become “Apocalypseburg,” a Max Max-infused wasteland of brooding and chainsaws. Lucy, aka Wyldestyle (Elizabeth Banks), stands looking out onto the desert bitterly bemoaning the end of days, while Emmett (Chris Pratt) listens to the peppy “Everything is Awesome” and sips sugar-filled coffee. Emmett doesn’t fit into this new world. Lucy encourages him to grow up and learn to brood, but he just can’t do it. Enter aliens from the land beyond the staircase—the “Systar System.” Get it. Systar. Sis-tar. Sister. The movie is about siblings fighting over LEGOs. With Duplo Block heart bombs, General Mayhem (Stephanie Beatriz) abducts Apocalypseburg’s fiercest warriors. This includes Lucy, and Emmett immediately rushes out to save her. Oh, and it’s also a musical. 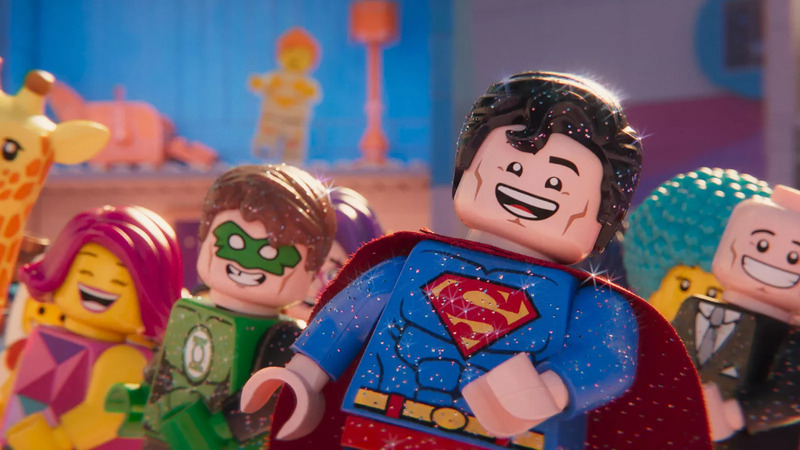 The LEGO Movie 2 crams plenty of incident into its narrative, all as a means of bringing about a fairly predictable story about growing up and learning to trust others and work together. A portion of this incident is entertaining. A song that knows it will get stuck in your head. A dual role for Chris Pratt involving a half-baked Kurt Russell impersonation. Raptor subtitling. It is a lot of stuff for a lot of people. If you don’t like the raptor subtitling, perhaps you will like the banana who constantly slips on his peel. I don’t like the banana, but I kind of like the action star cameo. Kind of. That’s the essence of the film: cram-it in, and somebody will enjoy it. The density of visual cues and self-reflexive lines of dialogue is commendable to a point, but in the end it doesn’t amount to much. The film has its charm. It would be a tough sell to call the density of bits lazy. But it does fall on its self-awareness as a crutch. In some instances, its self-awareness is a noticeable detriment. For example, characters exhibit verbal disdain over the fact that this sequel is also a quasi-musical, as if it is trying to get on the good side of people who might not like the songs. But some characters love the music, so the audience members who like the songs will not feel completely alienated. In the end, The LEGO Movie 2 is an upbeat yet relatively underwhelming sequel. It is fluffy and over-stuffed, and it is a machine of pop culture references and tongue-in-cheek gags. Some of it works, but it does not read as novel, overall, as its predecessor. Nor does it fully maximize its pop culture reference factory for comedy like The LEGO Batman Movie. At least the LEGO Aquaman says: “My man.” The movie could have ended there, and I would have been happy. I would have been happy, because the movie would’ve ended on a high note and avoided all of the plotting. But I also would have been happy because the ending credits is the best part of the movie. Not in the hacky critic sense of the end credits being the best part because you get to leave. No, the end credits are the best because of the song. This song is the self-awareness working and pitched to perfection.